Every year, the Cannes Film Festival takes place during the last two weeks of May, drawing celebrities from around the world who are keen to bask in the glamour of the French Riviera. France has long been a favourite destination for the rich and famous, many of whom choose to buy second homes or even settle permanently in the country. So where are the celebrity hot spots, and what makes them so special? 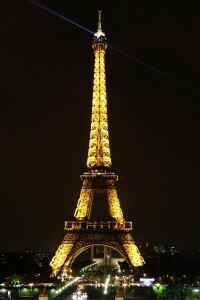 Let’s start with Paris, the city of romance. Many actresses have fallen in-love with both Frenchmen and their capital. In 1978 Charlotte Rampling married French musician Jean-Michel Jarre, and although they divorced in 1997, she has remained in the city ever since, comfortably working in both English and French. Most recently she’s appeared in British TV dramas Broadchurch and London Spy, and on a series of French TV commercials promoting insurance. Jane Birkin is most famous for her relationship with singer/songwriter Serge Gainsbourg, with whom she recorded the controversial hit, Je T’aime…Moi Non Plus. She has lived in Paris virtually all her adult life, recording albums and appearing on both stage and screen. So iconic is Birkin that French luxury goods company Hermès even created a leather bag in her name, versions of which retail for between $10,000 and $150,000. Four Weddings and a Funeral actress Kristin Scott Thomas married a French gynaecologist, with whom she has three children. Despite their divorce she continues to live in Paris and is said to consider herself more French than British. She still regularly appears in film and TV productions on both sides of the Channel. More recently, Scarlett Johansson married French advertising executive Romain Douriac. Their union might not have lasted, but it produced not only a daughter, Rose Dorothy, but a gourmet popcorn shop. Yummy Pop, located in the Marais area, is a joint venture between the actress and her sister-in-law, and offers popcorn in flavours such as truffle, parmesan and sage. Her The Other Boleyn Girl co-star Nathalie Portman is another actress to fall in-love with both a Parisian and his city. In 2012 she married ballet dancer Benjamin Millepied, who was her choreographer in the 2010 hit Black Swan, for which she won an Academy Award. With their two children they divide their time between Paris and Los Angeles. Away from Paris, the Loire Valley town of Amboise is famous for its royal heritage, its mix of medieval and Renaissance architecture, and for being where Leonardo da Vinci spent the last three years of his life. Nowadays, its most famous resident is Sir Mick Jagger, who bought the Chateau la Fourchette with his then-wife Jerry Hall back in 1980. He’d known and loved the area since camping there with his parents in the ’50s. Sir Mick is said to be well liked by the locals and even plays cricket for a local team. Actress and supermodel Jerry Hall is well-known for her ties to France. It was on the beach in St Tropez that she was discovered by a fashion agent, and her modelling career really took off in Paris, where she shared a flat with Grace Jones and Jessica Lange, both of whom were also modelling. More recently, she spent her honeymoon with media mogul Rupert Murdoch in St Paul de Vence, in the Alpes Maritimes, staying at the famous Colombe d’Or hotel, known for its museum-worthy collection of art. On their wanderings, they might have bumped into the former British TV power couple, Richard Madeley and Judy Finnigan, who own a villa there. 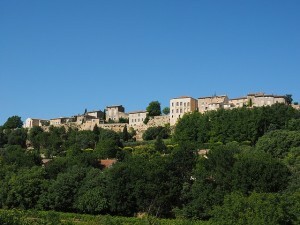 In a 2014 interview, Madeley described his love of nearby Vence, which he calls down-to-earth and authentic, with a strong sense of community. Not that far away, in the world’s perfume capital of Grasse, fellow broadcaster Andrew Neil owns a seven bedroom villa, which he bought over twenty years ago. It was its spectacular views that won him over, because the rest of the house was in such poor condition it took the next ten years to renovate. It was here that he wrote his book Full Disclosure, in 1997, detailing his experiences as the Sunday Times editor. Of course, many writers fall in love with the south of France, most famously Peter Mayle, whose 1989 memoir A Year in Provence chronicled his life in Menerbes, in the Vaucluse. A victim of his own success, he later fled France for the US when his home became a popular tourist spot. He’s since moved back, however, and now lives in Vaugines, in the Luberon. His 2004 novel A Good Year, about an investment banker who inherits a Provençal vineyard, was made into a film starring Russell Crowe, and his most recent book, Provence in Ten Easy Lessons, was published in 2014. Another writer who’s made France the subject of many books is actress Carol Drinkwater, who divides her time between homes in Paris and the French Riviera. In 1986 she and her husband stumbled upon what was a wreck of a house, located between Cannes and Mougins. It was long-abandoned, with overgrown grounds and no mod cons. They renovated it and have subsequently become olive farmers, and she has written several books on the subject, including The Olive Farm, The Olive Season and Return to the Olive Farm. The Cote d’Azur, with its beautiful coastline, stunning villas and glamorous cities, attracts many of the rich and famous, including three of the richest men in the world: Microsoft co-founders Bill Gates and Paul Allen both own properties on St-Jean-Cap- Ferrat, the glamorous peninsular between Nice and Monaco where a two bedroom villa can set you back €14,000,000. Chelsea football club owner Roman Abramovich owns the Chateau de la Croë, located on the Cap d’Antibes, which was once home to the Duke and Duchess of Windsor and, later, Greek shipping magnate Aristotle Onassis. The eternally-glamorous Joan Collins has owned a villa near St Tropez for many years, spending three to four months there every year. She says it’s the culture, the food, the light, the atmosphere and the people that make it so special. 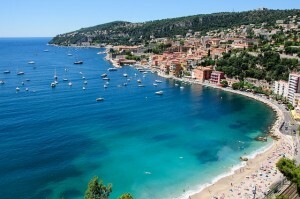 U2 frontman Bono chose the beautiful village of Eze, east of Nice, for his French home, right on the beach front. If he ever fancies a jamming session, his bandmate Edge also has a villa there, as does singer/songwriter Julian Lennon. Nearby, Villefranche-sur-Mer has welcomed the likes of Tina Turner and Keith Richards in the past, while the Rolling Stones’ former bandmate Bill Wyman has a villa in Vence, which he name-checked in his 1981 solo hit Je Suis Un Rockstar. Sir Elton John has what he modestly refers to as a ‘summer house’ on Mont Boron, in Nice, surrounded by pine trees and a national park, with spectacular sea views. House guests have included David and Victoria Beckham and actress Elizabeth Hurley, who stayed there shortly after giving birth to her son, Damian, in 2002. Former GoGos singer Belinda Carlisle, whose 1987 hit Heaven is a Place on Earth was a US chart-topper, divides her time between Los Angeles and Fréjus, in the Var, where she lives overlooking the Bay of Cannes. Recently, she joined local residents in protesting – ultimately unsuccessfully – against the arrival of a certain American fast-food chain in town. Whether this outcome has spoiled her own heavenly place on earth remains to be seen. Because of course, things don’t always work out, no matter how famous the celebrity or how stunning the setting. In 2008, Angelina Jolie and Brad Pitt leased the Chateau Miraval, a sprawling 1000-acre estate in Correns, in the Var, buying it outright in 2012. It has 35 rooms, its own vineyard, a recording studio, a private lake and a Romanesque chapel, where they married in 2014. So popular were the wines they produced, that the first 6000 bottles of rosé sold out in just five hours. Sadly, as we all know, they are now divorcing, and it’s rumoured the estate will be put on the market later this year. When Johnny Depp was with French singer and actress Vanessa Paradis, with whom he has two daughters, they enjoyed their very own paradise near St Tropez, in Plan de la Tour. More than a villa, theirs was a whole hamlet, comprising a main house, six cottages, two swimming pools and their very own bar and restaurant, set in 37 acres of olive groves, oak trees and vineyards. Their relationship didn’t last, however, and the property is now on the market for a cool $39,000,000. Another celebrity couple who bought in the Var are David and Victoria Beckham, whose Bargemon villa Domaine St Vincent, set in 200 acres, was said to enjoy the largest swimming pool in the department. They spent around £5m on renovations, yet are believed to have rarely visited. Perhaps the rumours that the villa was haunted by a previous owner kept them away, but they’ve since sold the property. More romantically, there are the celebrities who choose to get married in France. In 2013 actress Keira Knightley married her rockstar boyfriend James Righton in a low-key wedding near Avignon, where her family own an estate. Guests included actress Sienna Miller and Chanel director Karl Lagerfeld. Two years later Band Aid hero Bob Geldof married his long-time girlfriend, the French actress Jeanne Marine, in the stunning Var resort of Rayol Canadel-sur-Mer, with guests including actress Demi Moore and the Duchess of York. The celebrities expected at Cannes this year include Nicole Kidman, Jessica Chastain, Will Smith, Colin Farrell, Julianne Moore, Michelle Williams, Uma Thurman, Emma Thompson and Rhianna. Should any of them succumb to the romance of France, and be tempted to put down roots in the country, they’ll find themselves in pretty good company.